If you have noticed that your sweat smells like vinegar there could be a number of underlying causes. In this article, we will look at some simple home remedies that can help address the issue. But before we do, let’s take a look at what sweating is and some of the causes that create the vinegar-like odor. 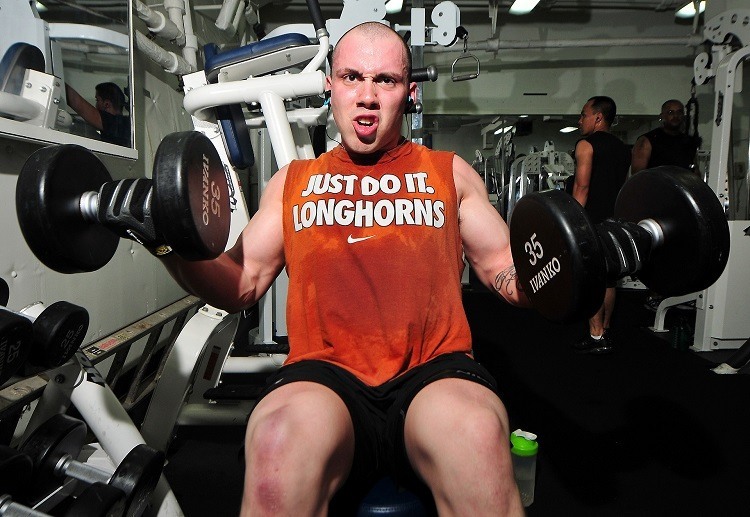 Sweating helps regulate the body’s temperature as well as assists in getting rid of waste matter. Sweat is generally odorless and sweat becomes smelly as a result of naturally occurring bacteria on the skin that breaks down sweat into it various compounds. The by-product of the breakdown of sweat is usually acidic in nature and cause body odor. Two common acidic compounds produced due to the breakdown of sweat by bacteria is propionic acid and isovaleric acid. Propionic acid causes the sweat to smell vinegary while isovaleric acid has a cheese like odor. Two major types of sweat glands exist in the body. These are the eccrine sweat glands and the apocrine sweat glands. And each of these two glands secretes different types of sweat. These glands are located all over the body and produce sweat that helps the body to keep cool. The sweat released onto the outer layer of skin contains water. These glands are located in the armpit, areola, eyelids and groin areas. The apocrine glands are generally bigger than eccrine glands and are responsible for releasing a thicker perspiration with waste matter that acts as a food source for the present bacteria. These glands do not function during childhood and only begin functioning after puberty. The breakdown of the sweat produced by the apocrine glands by the bacteria is what causes body odor. The sweat glands on the skin are where the propionic bacteria reside. This particular bacteria breaks down the amino acids into propionic acid which itself has a vinegary like the smell, and as a result, cause the problem, sweat smells like vinegar. Wondering ‘but why does my sweat smell like vinegarwhen sleeping or all the day’? 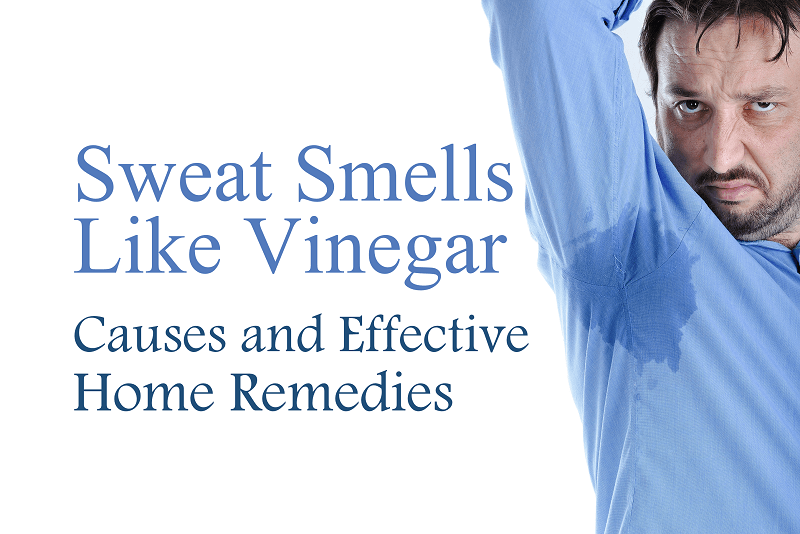 Check out the following reasons that are usually responsible for the vinegar sweat. Eating certain types of foodstuffs can contribute towards body odor. There are certain nutrients and other compounds in food that may cause the sweat to smell. Particularly if these nutrients and compounds are present in large quantities in the food being consumed. Compounds like sulfides have a rather putrid type of smell and get released during the digestion and absorption phase. These sulfides then get removed from the body along with sweat. When there are changes in the hormonal levels within the body, they can also cause the sweat to smell vinegary. A major example of a hormonal change that can affect body odor is menopause. The hot flushes associated with menopause can often significantly increase the release of perspiration. The bacteria start to break down the increased release of sweat and in turn, the bacteria release higher levels of acidic compounds which contribute to the vinegar like the odor of the sweat. While personal hygiene is a sensitive subject, a lack of personal hygiene is a common cause of sweat that has a vinegar-like odor. As discussed, sweat is a waste product that is released by the body and as such not bathing or showering on a regular basis results in the accumulation of the sweaty secretions on the skin. The bacterias act on the increased levels of waste on the skin and cause the vinegar smell. Diabetes is a medical condition that sees high levels of blood sugar. The breakdown of the sugars releases acidic compounds that could cause a vinegar-like odor to the sweat that is released. As a result, diabetics tend to have sweat that smells like vinegar. If the diabetes is not treated it can result in diabetic ketoacidosis. This is a complication whereby the body starts breaking down the stored fat for energy instead of the sugars. This is because of the lack of insulin which is needed to process the sugars. The process of breaking down the fat for energy releases ketones in the body. Increased accumulation of ketones can contribute towards changes in body odor. Try to wear clothes that are made of breathable fabrics that allow for the easier dissipation of perspiration. Shower or bath on a daily basis. Shower or bath after being outdoors or other activity. Avoid if possible any skin products that may affect the bacterial flora on the skin. The use of antiperspirant to help limit the bacterial action on the secreted sweat to help prevent body odor. Steer clear of eating too many spicy foodstuffs, particularly those foods known for their pungent flavours. Finding a natural way to eliminate the smell of vinegary sweat is as easy as looking in your kitchen at home. These simple home remedies can assist in the treatment of a strong or ongoing vinegary odor of sweat. Let’s have a look at some of the more common ones. Fight vinegar with vinegar you say? Well, yes actually. Apple cider vinegar itself is a weak acid and because of this apple cider vinegar is acidic to the area it is applied to on the body. The acidity of the apple cider vinegar makes where it is applied unfit for bacteria to thrive and grow. Take a cotton ball and soak it in the apple cider vinegar and apply/rub it on your armpits before you take your shower. What the apple cider vinegar does is make your skin’s pH unfit for the bacteria. Repeat the apple cider treatment before your morning and evening shower. If you prefer to bath instead of taking a shower, you can add one cup of apple cider vinegar to your bath water. Household baking soda can be used to absorb your bodies sweat and as a result, help reduce body odor. Another plus to baking soda is that it kills bacteria and acts as a natural deodorant. Take one tablespoon of baking soda and one tablespoon of lemon juice and mix together in a glass or bowl. Dip a flannel in the solution and apply/rub it on your armpits and the other sweaty areas of the body. Let the solution stand for a few minutes then rinse off the solution with clean water. Remember not to scrub the areas. Once you have done this, have your normal shower or bath. Apply this solution once a day for a few weeks. Rosemary is an herb which reduces the growth of bacteria. 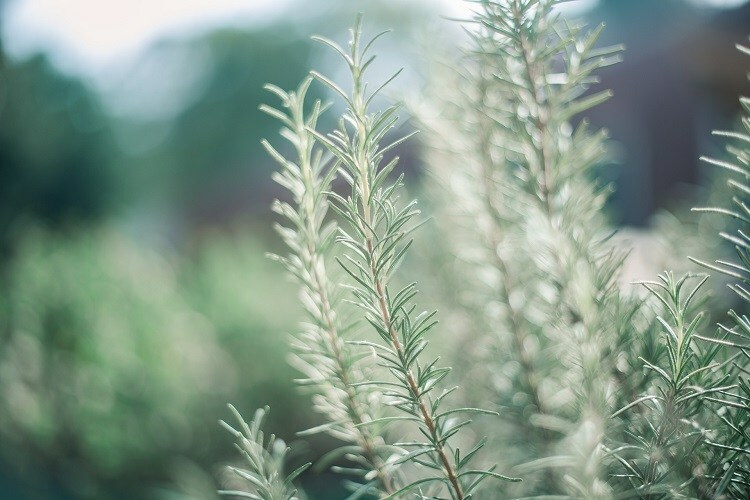 Rosemary contains both menthol and chlorophyll which both act as a natural deodorant. Rosemary neutralizes those strong body odors and gives the body a gentle fragrance. Rosemary contains zinc as well, zinc and magnesium deficiencies in the body are also associated with the vinegar smell of body odor. Take the rosemary leaves and boil them in a pot on the stove for a few minutes. Remove from the heat, strain the rosemary leaves from the boiled water and add the remaining water to your ready filled bathwater(you can replace the rosemary leaves by simply adding ten drops of rosemary oil to the water). After relaxing in the bath, simply dry yourself off. Do this at least once a day. We have used lemon juice with baking soda, but we can use it by itself as well. The acidic properties of lemon juice also help reduce the pH level of the skin. This, in turn, makes it difficult for the bacteria which produces the vinegar smelling odor to survive. Take a lemon and cut it in half. Now take the one half of the lemon and rub on your armpits as before. Allow the lemon juice to dry completely, then take a shower or bath. Keep to this routine once a day. A word of advice. If you have sensitive skin, it is advisable to dilute the lemon juice with water. If you have any reaction to any of the home remedies mentioned above, it is highly recommended that you refrain from using that particular solution. Now you will understand what could cause a sweat smells like vinegar and a few home remedies that can correct or prevent it.